on the Spell It With Fabric Blog Hop! We hope you’ve had fun making your way through the alphabet this week… I know we have! As you may have learned already, each stop on this blog hop will provide you with the patterns for 3 or 4 letters…along with some great designer trivia and the chance to win some pretty nice fabric. 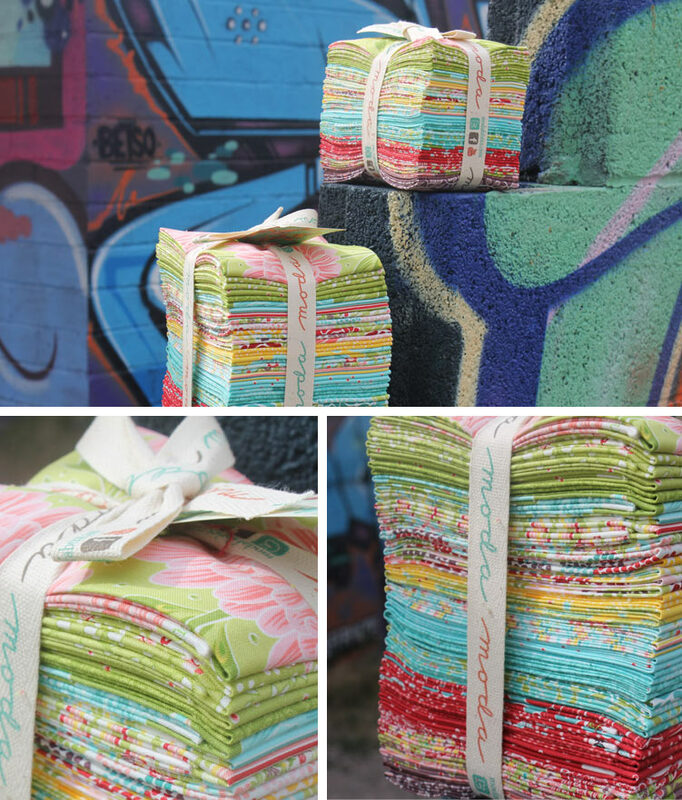 For our prize, we’re giving away a fat quarter bundle and a layer cake! (The layer cake is not shown in photos.) 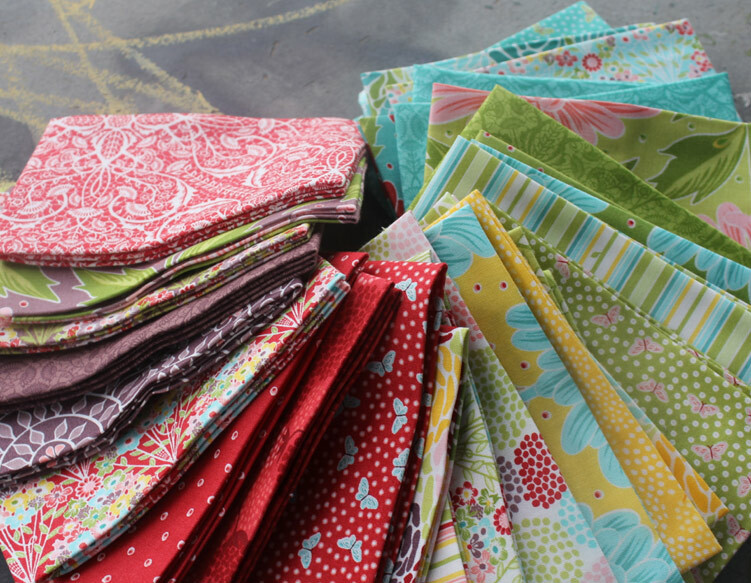 These fabrics are from our new line Chantilly! Yay! It’s our best yet and we hope you like them as much as we do. So, the reason we chunked in the layer cake is because we’re planning ahead with our blog! 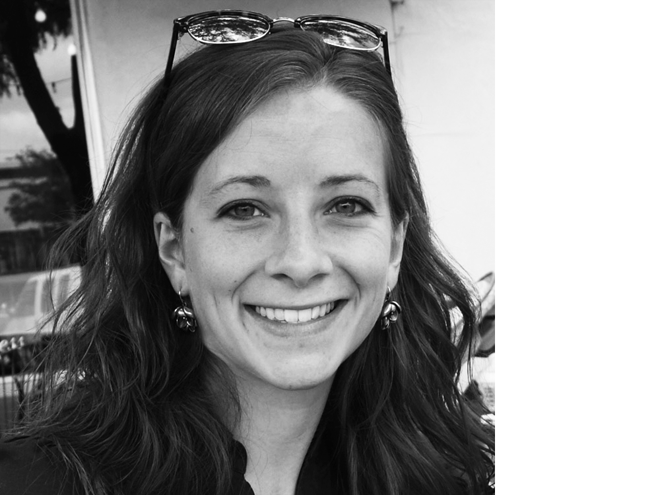 We have a blog post already prepared for next week, along with…. a brand spanking new FREE downloadable pattern. Which is super cool! 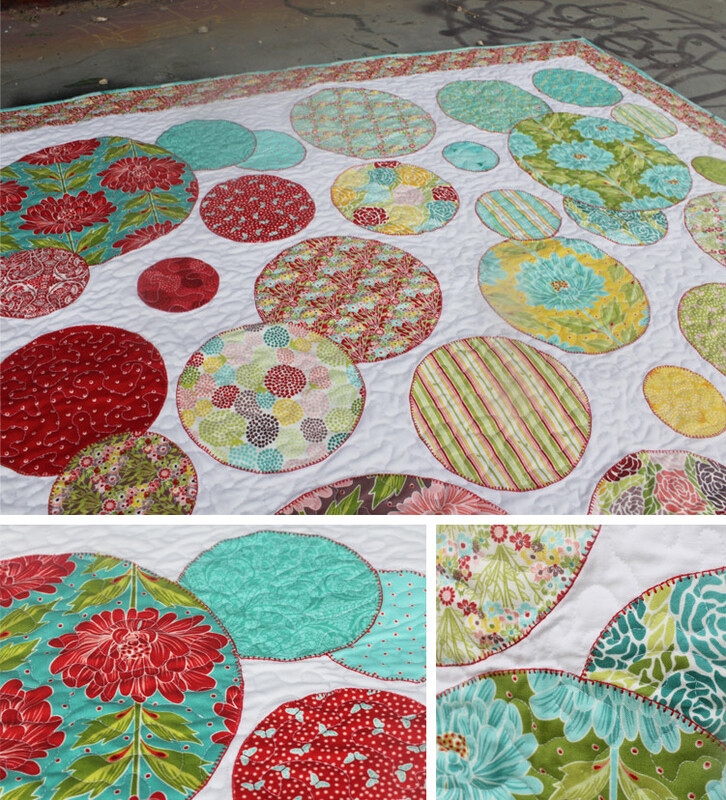 (See the sneak preview below… it’s a circle quilt. We noticed these are all the rage on Pinterest lately.) And the circle quilt uses one layer cake (plus border). So if you win it… you can save it for this nifty little project! your purse, your luggage, your make up bag, beer coozies, sandals, babies… you name it. We prefer to call it a monogram, but no matter what name you give it, this blog hop was right up our alley. You can find the basic pattern for the J block here. But my mom, JESSI, took this project one step further. 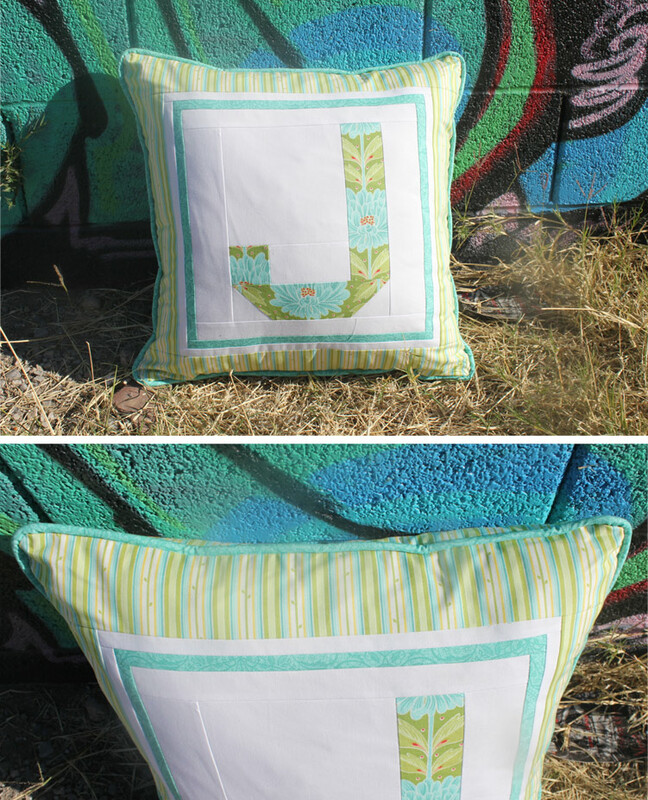 By adding two 1” sashing strips and a 3.5” border, our “monogram” now makes for a very lovely 20″ square pillow. For the mere JOY of it. After sewing my first quilt, I was hooked! Soon after, I remember describing the next quilt that I was planning, to my grandmother. She looked confused and asked, “Didn’t you already make a quilt?” Any quilt maker will know why that’s so funny! HOW TO ENTER THE GIVEAWAY… First, leave a comment on our blog. And then… if you want a SECOND entry, follow my Mom, on Pinterest. She’s totally obsessed with it and she loves getting new followers! 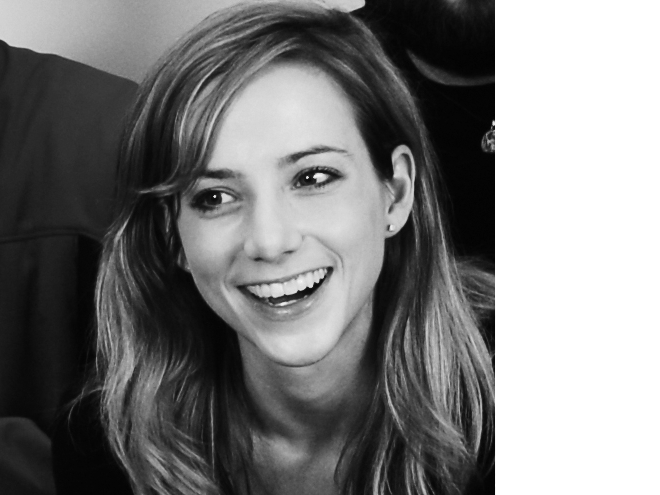 You can find her profile here… http://www.pinterest.com/jessijung/. If you do the second (Pinterest) entry… just leave a second comment so that I count you in the giveaway twice! This entry was posted in Chantilly and tagged Chantilly, Fun Little Tid Bits. Bookmark the permalink. Post a comment or leave a trackback: Trackback URL. I followed your mom too – as promised!! I love your fabric! It’s so bright & colorful – great for a spring project! I’ll follow mom too! I’d like to check her out too! Thanks for the giveaway!! I LOVE the cheery fabric line — especially those little butterflies! Keep up the good work ladies! I like the initial pillow idea. Very pretty. Thank you! Very nice fabric! I’m going to look for your circles quilt pattern and will be crossing my fingers to win your Chantilly layer cake. Thanks for the opportunity. Love the fabrics in that pillow! Hope you enjoyed your California camping adventure! Your new line of fabric is beautiful! Just love the colors. Gorgeous fabrics. I rely on the design bundles to make my quilts pop with color and blend beautifully. Have already used this fabric in Lori Holt’s Quilt Fun row quilt and love it!!! Need more and more!!! I’m going to follow your mom for sure! I am 79 and really enjoying hopping to the different websites. fun! I’m now following your mum on Pinterest too!